I want to thank Stephan at Biohacks.net for sending me an email about natto. I was well aware of how healthy the Japanese ferment was, especially its very high vitamin K2 levels. What I didn’t know until I researched it further was the fermentation time was just 24 hours. For some reason, I had always assumed it was much longer. Fellow Weston A. Price fans that read his book Nutrition and Physical Degeneration will recall the author theorized there existed a vitamin like activator. That “Activator X” turned out to be Vitamin K2. Chris Masterjohn wrote On the Trail of the Elusive X-Factor: A Sixty-Two-Year-Old Mystery Finally Solved for the WAPF site. Sticky, smelly, slimy and with an unpleasant aftertaste. Although I agree the texture is odd, it has always tasted fine to me, especially over rice with some mustard or soy sauce. Before we proceed, I though I’d mention my two motivations for making my own natto. The primary reason is the pre-packaged nattos sold at the Asian grocery store are loaded with crap we don’t want to eat. Seattle’s Uwajimaya is a nice grocery store and they sell probably 20 different brands of natto. However, they all have some nutritional defect. Soybean oil, MSG, wheat, or things listed I can’t even spell. For my natto, I picked the cleanest one. I wanted it for culture. Once I was up and running, I wouldn’t need to return to Uwajimaya for more natto. The second reason I decided to make my own is because I love to ferment. It is a cool hobby. Check out my Fermentation page for other ideas. Enough with the background, let us make some natto. I live in a city with a Japanese grocery store, so acquiring some pre-made natto was not a problem. Look for it in the refrigerated section. If you can’t acquire natto where you live, there are places online that sell cultures, including eBay. According to Natto King, the fermentation needs a stable temperature between 100-113 F. My oven is too warm as is my slow cooker. Although some slow cookers with a Warm setting might work with a water bath. 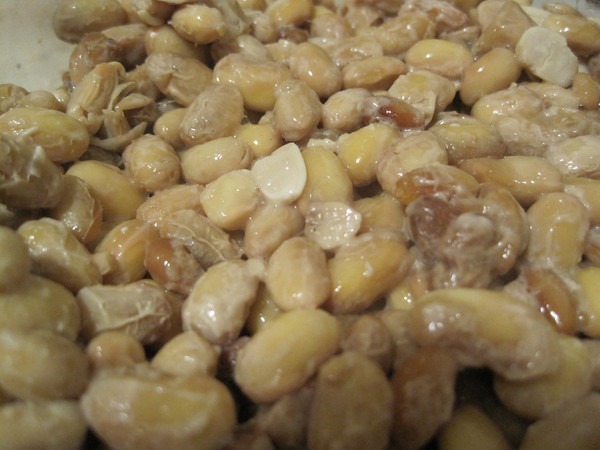 See Making Natto in North America on Umami Mart for info on that method. 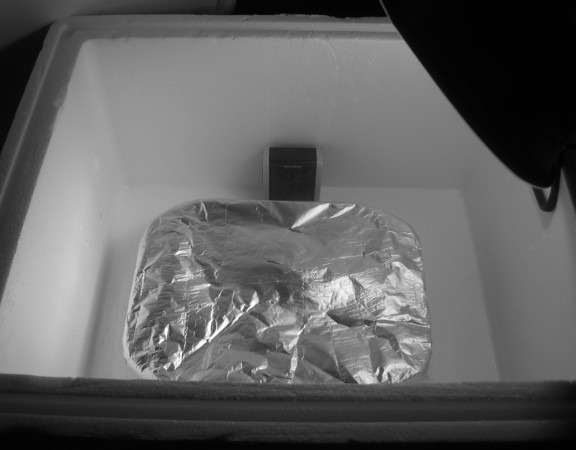 I decided to use a directed light inside a styrofoam cooler. 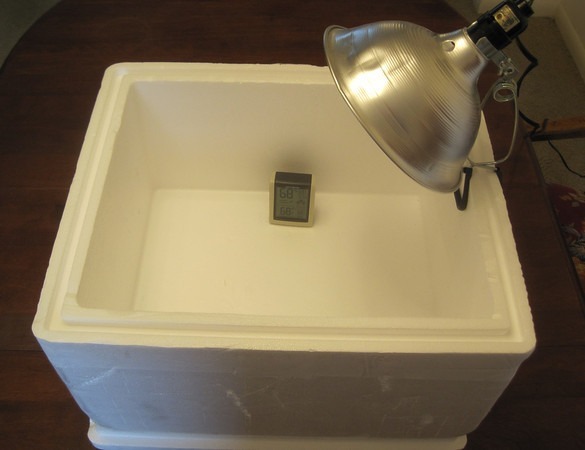 I got the idea from chicken farmers that build their own egg incubators. Mine would be a simple version of theirs. 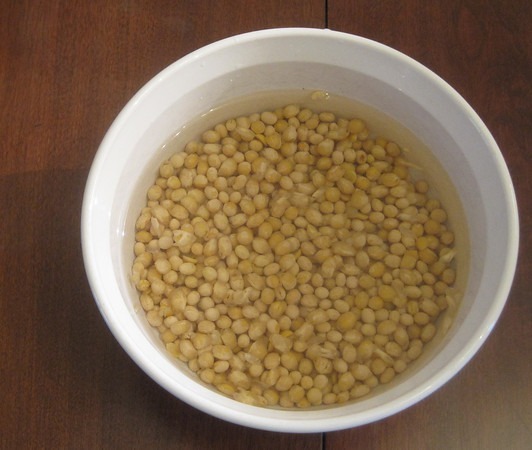 After rinsing the soybeans, I covered them in filtered water and let them soak overnight. They will triple in size. I steamed the soybeans in my stock pot for 1 hour. You could also boil them or use a pressure cooker. Before I forget, while the soybeans were steaming, I put my Pyrex pan in the oven at 250 degrees to sterilize it. Got that idea from Umami Mart. Mix the cooked soybeans with the package of natto. I added a little bit of hot water to the packaged natto to loosen it up for stirring. I covered the Pyrex with foil, poked a few hole so it could breath and set it into my incubator. I monitored the temperature and let it ferment for 24 hours. Here is the natto after 12 hours. I had a small sample at the end of the ferment that I was pleased with. 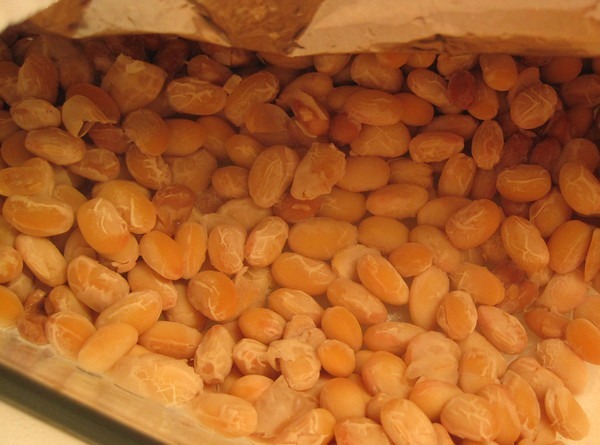 However, most of the online resources say that the flavor of natto continues to develop for a few days to two weeks. That it did. More gooey fun! During the fermentation, I didn’t smell anything. That could be because I used a small amount covered or maybe its odorous reputation is unwarranted. I’ve never considered it a stinky food. Slimy yes, stinky no. Next week I will make my second batch of natto using a culture from the natto I made. I will also attempt the WARM setting on my backup slow cooker, although I am concerned it will get too warm. I’ll be certain to update this post with that information. Previous Headache Remedies That Work? MAS, kudos for trying natto and for experimenting with fermenting it yourself. Sounds fun. My wife and I ferment lots of veggies, kefirs, yogurts, and more. For extra vitamin K2 and adventure, I also tried natto (only store-bought, so far). The good news: I can stand the taste, smell, and texture. Do you have ideas for headache-free natto? For example, I could soak or rinse it with water. Vitamin K2 is fat-soluble, and presumably poly(glutamic acid) has significant solubility in water. The problem is apparently in the natto itself (not an additive); otherwise, I’d think that homemade would be the fix. Do other people who are sensitive to MSG also notice a reaction to natto? I already eat raw-milk kefir, grass-fed butter and liver, pastured eggs, fermented vegetables, fermented cod liver oil, and fish eggs for vitamin K2. I know that list is long, but I want the world’s best source, ha! @Griffin – I do recall seeing a few brands without MSG. They exist. However, your best bet however would be to get the culture on eBay and do it yourself. 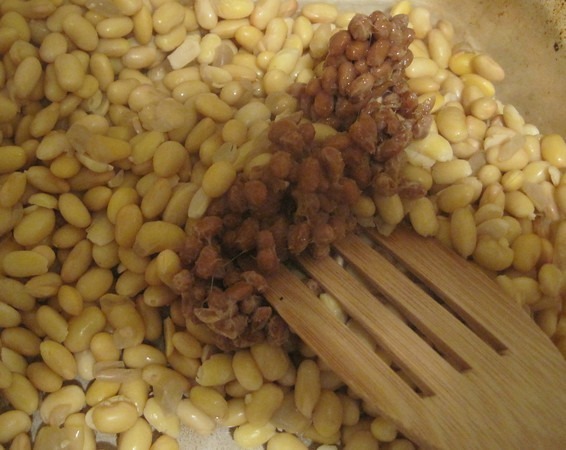 Is it possible to ferment natto on beans other than soybeans and still have K2? Like black beans? I would think so, since I’m assuming the K2 and other health benefits of natto come from the bacteria. Also does it have to be beans? Could it work with vegetables like cabbage or carrots? @Rajan – I have read how some people are using chickpeas instead. Here is one link. Hi Michael, it’s Alison. 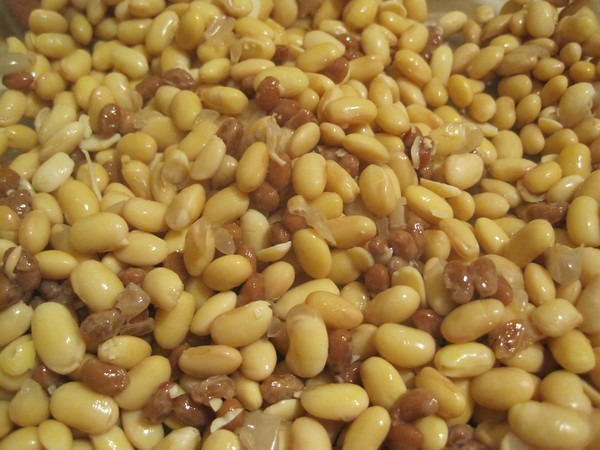 What do you think of using a legume other than soy for natto? 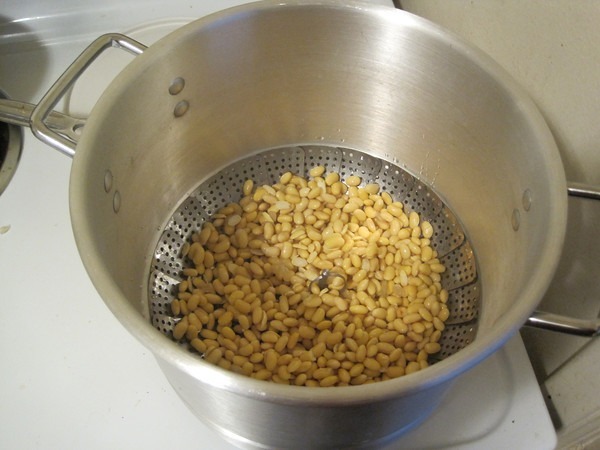 @Alison – I haven’t tried other beans but Cultures For Health says you can use use garbanzo and black beans. Let me know if you try it. I use black beans most frequently and must say they make the tastiest natto I’ve ever had. I reckon any beans would work and encourage experimentation.